Cool news. If you go to Renegade Kid's website on the 3DS browser, you can view early screenshots of the game in full 3D! Neat! Okay, well this just shot up to my most anticipated title on the 3DS, looks like this is a follow up to Dementium 1 and 2 in all but name. I'm very much looking forward to this (I dig me some horror games) but...are they developing this with DS hardware? It really doesn't look like a true 3DS game. Or is it just me? By the way, if you scan the QR code in the pic below with your 3DS, you can view the screenshots in 3D! Neat! Well it's an early build, and these guys are a low-budget operation, I'm sure it will look great technically and have an immersive atmosphere, but I don't expect to see RE Revelations level geometry and textures etc. considering Renegade Kid is like 3 people and the budget for this game is probably less than 5% of a lot of major titles. I do wonder if they showed it too early though, it seems like they don't have much to show besides for the dude walking around a creepy church holding a wrench. EDIT: Man I love that artwork, it so blatantly demonic and satanic, actually kind of surprised that Nintendo would allow something like that up on the eShop. 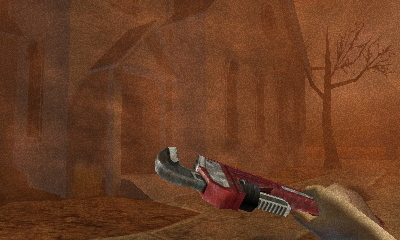 I never got to play the second Dementium game, but the first one was a pretty solid FPS experiment, I thought. Can't wait to see some gameplay footage! I am looking forward to this. The 3DS eShop is showing no signs of slowing down anytime soon. Dude, Dementium 2 is a massive improvement in every way, it's a masterpiece and one of my favorite games of all time. If you liked the first game you owe it to yourself to play it. If you can't find a copy PM me with your addy and I'll send you one, I'm dead serious! Wow, that's some impressive enthusiasm and kindness right there! For some reason, I could never find a store --online or otherwise-- that carried the game here in my part of Europe, back when. Not at an affordable price, anyway. These days it seems I'll be able to get a cheap copy off Amazon UK, though, so I'll buy myself a copy at some point! If you were put off by ANYTHING in Dementium, they ALL got addressed in the sequel. Dude, you should be hunting yourself down a copy ASAP. And Charles, it doesn't get any more satanic than DOOM, and that game and DOOM 2 even showed up on the GBA. Why are you thinking Nintendo is stuck in the pre-ratings 80s? I wouldn't say I was put off by anything, I was pretty pleased with what was there. Felt like a fun combo of Doom and old school Resident Evil, with a hint of Silent Hill, and I'm all for that. I mean, sure, if I were to compare it to big budget games or the horror classics there's stuff to be desired, but I was too impressed by the game as an indie effort to think about that. I suppose the plot and themes felt a bit predictable, but it wasn't as if I expected that to blow my mind either. I think the big difference is that in The Ward you were basically stuck in the hospital and there was maybe only level (the part where you go outside and into the chapel) that had any visual variety, but in Dementium 2 you traverse several different kinds of environments, including some larger outdoors areas, that are all unique and just oozing with atmosphere. Plus the graphics are better, there are more different kinds of enemies, the weapons feel better, the puzzles are more frequent and are designed better, the boss battles are ratcheted up, more voice acting, better sound design, more/better pre-rendered cutscenes. Just more, and better, of everything, it's more better! I would just worry that conservative groups would get offended by putting a cross and a crucifix in the same artwork, but you're right, Doom and Castlevania and other games have been doing that stuff for years. This is a definite buy! Video game idiocy does not have an R or a D attached to them. Its not even repubs that are the drivers of video game censorship at this point. As a rule of thumb, attorneys and politicians are guilty until proven innocent as far as I'm concerned. Renegade Kid is literally three people haha. Two programmers and one art guy. Budget is very low, but probably much higher than the original Dementium due to their eShop success. It's pretty amazing what they can pull off with such a small team. Or...maybe because the team is so small, they can really focus on the product they are making and polish the heck out of it. Speaking of which, I was playing a bit of ATV Wild Ride 3D last night and was having a blast with it. I hope Renegade Kid makes money with that game too, because it's quite good. Reminds me of playing a Dreamcast game...and I mean that in the best possible way. Honestly. Anyway, I hope they can polish up the visuals a bit more with this new game. I have absolute faith that Cult County will be a visual stunner, after the graphical witchcraft they were able to pull off with Dementium 2 on the DS they have my complete confidence. Have you downloaded the pics to view in 3D yet? They look great! Yeah! It was cool, more devs should do that! That's the thing I love about Joolsies, always going the extra mile. Yeah, being able to get screenshots via that QR code was a really nice touch.